E Ink is best known for the e-paper displays on the Amazon Kindle, but the company also has their hands in many cookie jars. They have a series of official partners who develop screens for cosmetics, bus signs and art galleries. Sometimes people purchase development kits through the new e Ink e-commerce shop and do some fairly amazing things, that could possibly birth an entirely new segment. 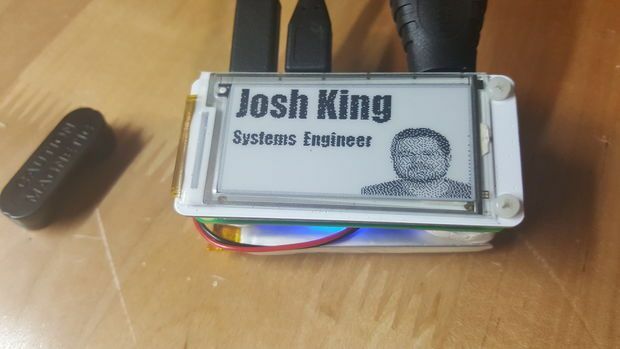 Josh King is a systems engineer at Cisco and he recently developed an E Ink name tag that uses a Raspberry Pi Zero and the Linux operating system. Josh posted a series of instructions that document the entire process, which is solid for anyone else who wants to make their own name tag.